"This recipe is my grandmother's. 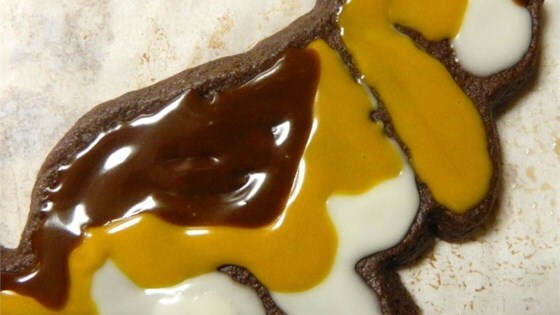 this will be the best chocolate cutout cookie you have ever tasted! Very chocolaty with a lot of taste! Everyone asks for the recipe when I bake these! The kids love them so its time to share!! ENJOY!" Sift together the flour, cocoa, baking powder and salt; set aside. In a medium bowl, cream together the butter and sugar until smooth. Beat in the egg. Gradually stir in the sifted ingredients to form a soft dough. Divide dough into 2 pieces, flatten and wrap in plastic wrap. Refrigerate for 2 hours. Preheat the oven to 375 degrees F (190 degrees C). On a lightly floured surface, roll the dough out to 1/8 inch in thickness. Cut into desired shapes with cookie cutters. Dough is sticky so be sure to add more flour to the rolling surface as needed. Place cookies 1 1/2 inches apart onto cookie sheets. Instead of using flour when cutting out shapes, use cocoa powder! That way you cant see the flour after baking.